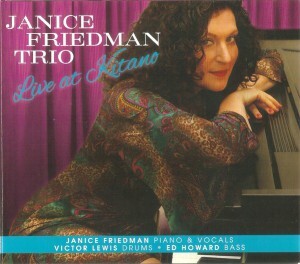 Claire Ritter, Deanna Witkowski and Janice Friedman are not household names on the piano jazz circuit. But like the best ingredients, their taste and intrigue far outshines their notoriety. In late 2014 and 2015, each released a recording worthy of “top ten” status as well as repeated listening. 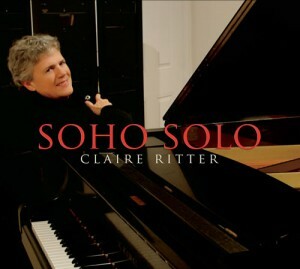 Once a student of Mary Lou Williams and later Ran Blake, as well as former faculty at the New England Conservatory of Music, Claire Ritter has amassed a long list of grants and awards for performance, composition and teaching over her career, as well as releasing a dozen recordings and writing more than 200 compositions. Jazz Times described her music as “painterly, exquisite and poetic,” three words that surely fit the 18 original works and two covers on Soho Solo (Zoning Recordings, 2015). Ritter herself notes that the music “felt lighthearted yet poignant, with a twist of the South.” That “twist of the south” reflects a blues-tinted, Monk-like approach to many of these (mostly brief) compositions, which tend toward angular and spare forms yet surprisingly melodic and hinting at strong classical underpinnings (e.g., the opening “Integrity,” “The Chanson,” “Blink”). And sometimes that classical foundation is more blatant, as on the Chopin-esque “Where the Gardenia Grows”. Yet there’s also the swinging joy of nods toward Fats Waller as well (e.g., “Blue Grits,” “Soho Blues,” “Cool Digs”); the delicate Ellingtonian lyricism of such elegant tunes as “Costarican Dawn,” “Eclipse Orange,” “The Brook and the Bird”), and even suggestions of Joplin (“Walking Zig”). It’s not all from a classical jazz perspective, however, as tunes like “Mirrors” and “Blue Heron Serenade” conjure more modern masters like Kenny Werner or Fred Hersch, and a “fractured” Latin feel creeps into “Sunshades” and “High Beams”. Ritter gives Ran Blake’s “Breakthrough” a Monkish turn, and Harold Arlen’s “I’ve Got the World on a String” swings with tipsy Jelly Roll attitude. The influence of Mary Lou Williams is unmistakable throughout, yet the sum is wholly original. 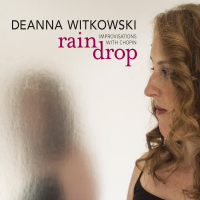 Deanna Witkowski wasn’t looking to Chopin to inspire original improvisations, but rather intended to directly arrange Chopin works in tandem with Brazilian and jazz standards, unified by mood and harmony. Yet along the way, she found herself creating spontaneous, relatively brief improvisations that became six of the fourteen solo tracks on Raindrops: Improvisations With Chopin (Tilapia Records, 2014). Winner of the 2002 Great American Jazz Piano Competition, Witkowski has been praised by Jazz Times, which noted that “if Brad Mehldau and Bill Charlap represent the gold standard among contemporary pianists, then Deanna Witkowski deservedly ranks as their sterling sister.” Although never mentored by Mary Lou Williams, like Claire Ritter, Witkowski’s career reflects significant inspiration from Williams’ sacred works, combining her affinity for jazz and liturgy in her teaching and composition. Raindrops moves in a more secular direction than her previous release, the liturgical jazz album From This Place (2009). In addition to the six brief Chopin-inspired improvisations, Raindrops includes 8 tracks of Chopin (nocturnes, preludes, etudes), three of which are melded to familiar Brazilian standards (two from Jobim, one for Luiz Bonfá), another paired with “You and the Night and the Music.” Witkowski takes some liberties with Chopin, but these are not “jazz arrangements;” rather she extends some of the harmonies and adds some improvised passages that seamlessly preserve the essence of Chopin — to 21st century ears, these remain Romantic masterpieces. Throughout, Deanna’s exquisite touch and dynamics are on full display, be it Chopin, Jobim, or Witkowski. The pairings of Chopin and Jobim are brilliantly presented, such that the listener recognizes how readily the two composers mesh. In fact Jobim directly borrowed from Chopin’s “Prelude No. 4 in E Minor” in writing “Insensatez”, and across the pairings, Deanna elegantly muddles the transitions, such as reharmonizing Chopin’s famed “Funeral March” (“Prelude in C Minor”) just enough to slide it into Jobim’s “Olha Maria”; “Nocturne in E Minor” flows elegantly into Bonfá’s “Manhã de Carnival” as if the two works were born of one mind (and indeed the opening melody lines are very similar). Surely Chopin would have approved of Witkowski’s original improvisations, which for the most part mirror the mood and tempos of the nocturnes and preludes but extend the harmonies further into the modern era. If taken separately, the six tracks could form a cohesive suite, the last two (“Following Intuition” and “In Parting”) forming two choruses of one ethereal song. New York native Janice Friedman has also enjoyed a career covering performing, composing and teaching (including a 12-year stint at Rutgers). Her previous release was the solo Half and Half; for her fifth album, she returns to the trio format and the eclectic programming that has enlivened her earlier recordings as well as her performances in the New York area. One such performance (recorded in 2011) yielded Live at Kitano (Consolidated Artists Productions, 2015), featuring Ed Howard on bass and Victor Lewis on drums, with Janice adding her own vocals to three of the tracks. Six tracks offer a diverse selection of covers, from a prancing run through Cal Tjader’s “Curacao to a jaggedy interpretation of George Gershwin’s “My Man’s Gone”, from a swaying, swampy piano/vocal arrangement of Billie Holiday’s “God Bless This Child” and the bluesy Ray Charles-ish spin through Dr. Billy Taylor’s “I Wish I Knew How It Would Feel to Be Free” to the punchy closing, Lerner and Loewe’s “Wouldn’t It Be Loverly?” featuring Howard’s frenzied bass and Friedman’s equally swiftly articulated vocals and piano. Janice describes her arrangement of Charles Davis’ “Half and Half” as an “Irish drone”, a perfect vehicle for the collaboration of the three musicians with Howard in overdrive and Lewis providing atmospherics throughout. Chopin appears here, too, as Friedman stirs “Nocturne in F Minor” into a swinging waltz (“Nocturned Left”). Of the Friedman originals, the opening “Get Set” is a rhythm changes tune that Janice notes is “swingin’ ala Oscar Peterson: happy and bright,” more bebop than old-time swing. “Lonely Sky” sets the words of Lee Charles Kelley to music, Janice’s vocals in tandem with her elegant, samba-kissed piano lines. Gently flowing at the start, “Ripplin'” morphs into a waltzing trio journey with twists and turns that highlight each of these artists.